Home /Environment, Government run amok, Resources/Wildfire Winter? Nuclear war breaks out between the Soviet Union and America. Following the path of Mutually Assured Destruction (MAD) the dueling super powers blast one another in retaliatory strikes obliterating 80 percent of the Northern Hemisphere’s population, and sending the entire civilized world into a maelstrom of ruination, degeneracy and protracted starvation. The thermonuclear blasts are followed by unimaginably hot, fast moving fires that incinerate everything from living organisms to the soil itself, turning the earth into a blackened, fuming rubble, made even more dark by a smothering blanket of smoke, soot and deadly vapor covering the globe in its entirety. Those groveling creatures which remain are subjected not just to the deadly aftermath of nuclear holocaust; radiation sickness, burns, economic and social collapse, and stone-age living conditions, but winter–gray, cold, endless winter, which freezes all attempts to grow crops and rebuild the ruined civilization of men. Nuclear Winter is the bleak, bitter denouement following the climactic nightmare of planetary nuclear war. Sounds bad, eh? Well, fortunately this theory has yet to be tested, and we hope it never will. But there are prototypes, smaller versions of Nuclear Winter that humankind has endured for eons. Widespread crop failures doomed many farms in the summer of 1816, forcing mass migrations in the United States and around the globe. “The Year Without a Summer” saw temperatures plummet, interminable cloud cover, and endless days of cold and rain that supplanted the sunny warm conditions of growing season. There were no nuclear weapons in 1816, but in 1815 there was the colossal explosion of the Indonesian volcano, Mt. Tambora. The eruption of Tambora spewed ash, pumice, smoke and deadly gasses miles into the atmosphere, which then circled and engulfed the globe for more than a year. Lasting only a year or so, the effects of 1816’s Volcanic Winter were nonetheless, cataclysmic to hundreds of thousands. Wildfire season, 2018, provides a troubling case study of Wildfire Winter. Although relatively localized, the impact on farmers, ranchers, and food producers in general, has been crushing. Waters, who serves the Columbia Valley in Washington, says its sun-drenched climate is ideal for crops like potatoes. There has been heavy smoke coverage for more than two weeks, reducing sunlight, he told a local news radio station. That will likely delay harvest, which will likely be made up of slightly smaller potatoes, lowering the yield a little. There’s also an increased chance for soil-borne pathogens, since more vines than usual will die off. On Mike Pink’s potato farm at dawn, the sun is an angry red ball low in the sky. This summer, wildfire smoke has blanketed much of the West for days and weeks. And that smoke has come between the sun and ripening crops. Pink watches as his year’s work tumbles onto a fast-moving belt and into a waiting semi truck. He’s got most of his 1,600-acre potato fields yet to harvest on his 3,000-acre farm, spread over about 40 miles between Burbank and Basin City, Wash. And this thick smoke makes him nervous. Lost sunlight and too much heat means that Pink’s french fry potato crops aren’t gaining precious tons. He estimates one week of smoke will cost him around $34,000 for just one of his many fields. The article said grapes are unlike other agricultural products, in that the skins are permeable. Free volatile phenols created by burning wood become part of the grape itself. As more than 600 wildfires continue to burn across the province, residents shared images of the smoky skies on social media. 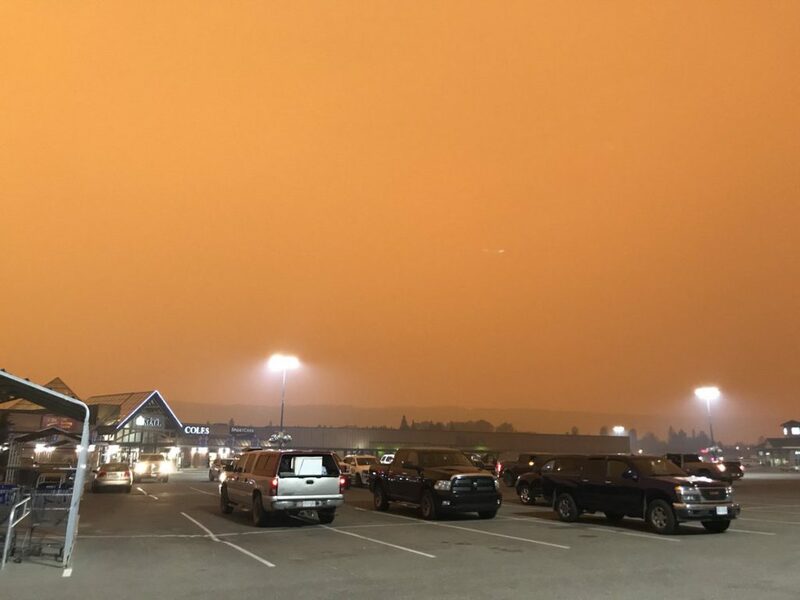 Many of the photos were from Prince George residents who captured an apocalyptic-looking evening as smoke darkened the sky. Marie Dimmery and her family moved to Summit Lake a few months ago from Chilliwack. She says she was speechless when she saw the sky. It is the confluence of misguided government forest management and failed environmental policies that impede logging, clearing, grazing and other effective approaches to fuel load mitigation, that makes Wildfire Winter so worrisome. Unlike massive volcanic eruptions, Wildfire Winter is not inevitable. Human beings have a high degree of control over the size and intensity of forest and rangeland wildfires. It has been proven time and time again that where active forest management which treats trees as a resource, not sacred, untouchable edifices, the trees themselves–not to mention the wildlife and the people–benefit. Wildfires will always occur in nature, and under well-managed forest conditions, fires can renew ecosystems and help some plant species to germinate. But “thou shalt not touch the trees” environmental policies have resulted in forests that are overgrown and clogged with diseased, dying, dead, tinder-dry trees. And these conditions make Wildfire Winter and its destructive consequences a sure thing. As Reagan and Gorbachev took the threat of global nuclear war and the possibility of Nuclear Winter seriously, and pursued Detente in order to ensure the survival of the civilized world, governments at all levels need to take Wildfire Winter seriously, and pursue a path of sound resource management to ensure the survival of our forests, our crops, and the people who depend on them.